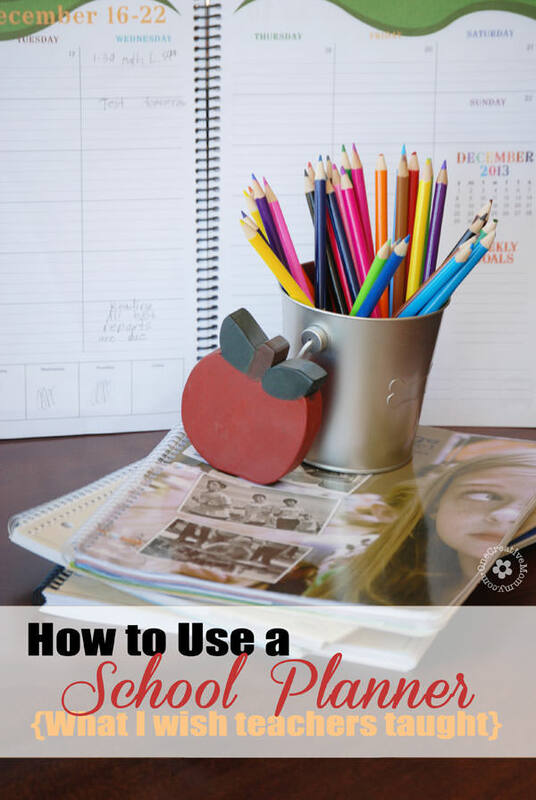 How to Use a Daily School Planner — Back to School Tips! 1. Write down due dates! This is the main thing that I wish teachers would teach the kids. Currently, my kids write down their assignments that are due the next day, but that is all. I can’t tell you how many times I’ve asked the date of a test–only to get a blank stare in return! So, when the teacher gives long-term assignment, write down the due date! Simply writing down a due date for a paper or test is not enough. It’s easy to procrastinate when the due date is far away. Once you have your final due dates written in your planner, it’s time to set your own deadlines for studying and writing. Monday–Outline and write the introduction. Thursday–Revise and edit. Type the final paper. Imagine this . . . all week, you planned to finish writing your essay on Thursday night. You arrive home from school that day to find out that your family has planned to go to dinner with your favorite aunt. 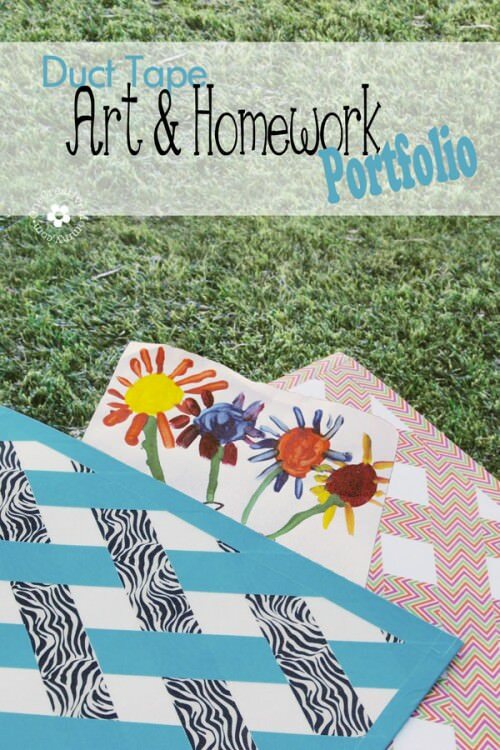 Now you have to choose between a fun family event and completing your homework. Bummer. Nothing ruins your study plans like unexpected plans! Set aside a time each week that your family will come together and plan. At the meeting, everyone brings their calendar or school planner and shares what’s on their schedule for the week. Don’t forget to include your sports, lessons, and other activities in your planner. That will help you know which days you have less time to study. It’s no fun to think you have completed your homework only to bolt up in the middle of the night — realizing that your forgot something! 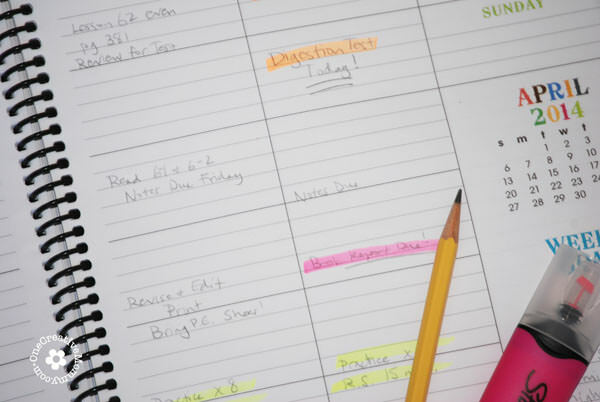 Before you begin studying, check your planner to make sure that you make time to complete all of your tasks. If there is a skill you are trying to learn, a habit you are trying to break, or a goal your are striving to achieve, your planner can help you! Write down daily reminders and things to keep you motivated! For example, my oldest is trying to read her scriptures every day for a specific amount of time. If she writes that in her planner, and sees it as she starts her homework, she’s much more likely to remember. If you didn’t get all the due dates written down, have Mom or Dad check their email. Often, teachers send weekly newsletters that contain spelling lists, due dates, and other important information. Planning will get easier as you do it. Soon, you won’t need your parents’ help very often at all! What do you think? 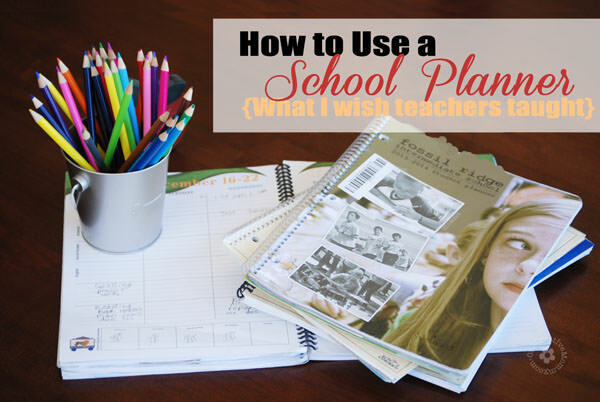 Will you change the way you use your school planner? What’s your best planner tip? I’d love it if you shared it in the comments. Thanks for stopping by today. I hope you’ll stick around and check out some of my other ideas. Images below are linked. Great tips – I will forward to my older kids! Thanks, Amy. I hope it helps them. There’s so much a kid can do if they know how to plan! I LOVE planners. Used to be an English teacher before having kids, and I taught using planners to my freshmen. So important. I’m struggling right now on teaching my Kindergartener how to use one or if it’s too early. What do you think? We already have a family planner/calendar that is on the wall. My kids had planners in kindergarten, but they were only used to write down the daily assignments and spelling words so that the parents knew what the kids should be doing. 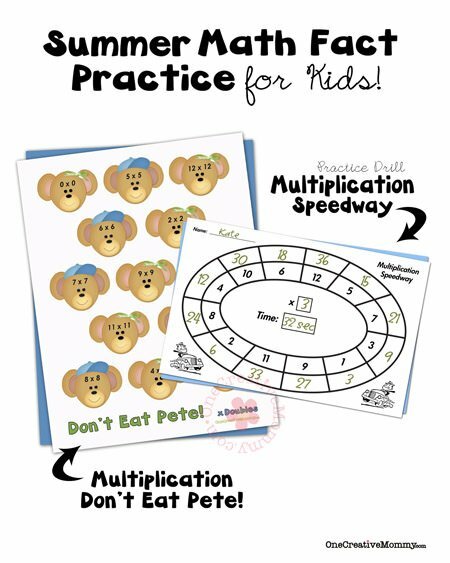 I think they mainly work best that young for writing practice and as a communication tool with parents. I’m not saying don’t teach her, but I don’t think they have much they need to organize yet. Thanks for teaching the freshmen! I wish they started sooner. Good luck with your kiddos. Thanks so much, Maggie! I’m honored. Off to check it out. Great tips! Last year, my 4th grade son had a test calendar, or at least he was supposed to. The teacher didn’t seem to keep up on giving the kids the monthly calendars. I love the idea of adding reminders for the steps for the bigger projects in the daily planner. I think the planners are a great idea in school. I also think that the kids need to be trained a little better as to how to use them, though! I’m glad to see that my 7th grader is using hers better this year–even without my tips. Yeah, teachers! 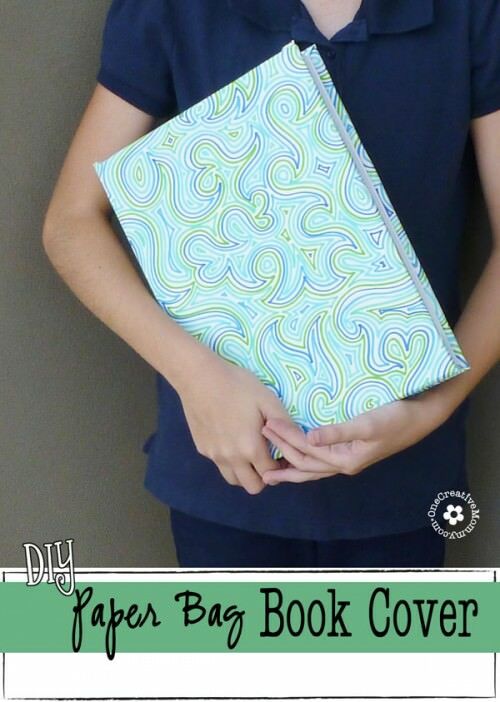 The kids in our school get free planners, too. I just wish they were taught to use them more effectively. I’m happy to see that my daughter is learning to use hers better this year in 7th grade. I need to do better at keeping my own planner, too! It definitely helps keep the family organized. Great tips that can be applied for adults or kids! That’s right, Heather. I need to use some of these tips for myself! I have to sign my kids’ planners, too. I love that your son’s planners were blank. Typical boy! He seems to have made it through, anyway! You’re welcome, Megan. I hope you have a great weekend! Brilliant tips – especially the one about setting your own deadlines. It’s no good realising something is due tomorrow but it’s going to take a week to complete it! Thanks, Clare. If only I could get it through to my 12-year-old that projects take more than one night! Actually, the planner is helping. Things are getting much better. Thanks, Cathy. I love that my kids get planners at school, but it takes some work for them (and for me) to really use them correctly. My oldest is in middle school this year, so we really need to get this down!